Conigliaro Industries, Inc. About Us, Conigliaro Engineering pioneering the brand new field of “Total Recycling”. Conigliaro Industries, our computer recycling services and our product Boston's Best Cold Patch were recently featured on Channel 5's Chronicle Show. The segment, entitled "Who Knew," featured our unique process for recycling computers and turning the resulting plastic housings into pot hole filler…or how we turn the information highway into the highway! Destruction is their business and business is good. Massachusetts is filling potholes with old computers! "We were extremely pleased to learn that we could keep a significant amount of re-roofing material out of the landfill by recycling the existing roof membrane. Not only did recycling the existing membrane make sense and help us move towards our goal of being more environmentally responsible, it allowed us to help our customer, Sara Lee Bakery, realize it's goal of reducing the amount of waste generated at the facility. Sara Lee was very supportive of the idea and Nationwide Foam made it easy for us to offer this service. 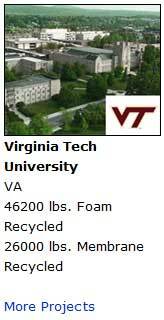 We will look to Nationwide Foam in the future as a source for recycling membrane and foam insulation boards on all our re-roofing projects." "The recycling portion of the project went very smoothly. I will continue to use your company as a resource for our future re-roofing projects. Thank you for your assistance with the project." Tom Caspari, Missouri Builders Service, Inc.
"Everything went very well, we are looking forward to working together again soon." "With the size of the roof, there would have been a lot of EPDM and insulation heading to the landfill. As it turned out, NFI was able to save us money by recycling the EPDM and insulation. And, we were happy to keep all that material out of the landfill." "It was a smooth and straightforward process for us. Nationwide completed the job as quoted with no hidden charges. In fact, even the ballast was hauled away to be cleaned and recycled, so everything that could be recycled on this job was recycled." "It was a pleasure working with you on this last job and I will recommend NFI to other companies I work with. Thank You." "On a sizeable project like this we felt that offering to recycle the old materials was one more way for our bid to stand out. We felt good being able to support the environment. With the additional cost savings there was no reason not to do it." ©2012 Conigliaro Industries, Inc. all rights reserved.